The Ford Mondeo is back with a new look, new interior, more technology, and being all new from the ground up, it should be even better to drive than before. Here I test drive the new Mondeo in estate format (or Wagon as Ford refer to it as). The estate is a great option if you need a more practical boot than what the Mondeo hatchback offers, or if you like the looks and image that goes with an estate car. The first thing that gets you with the new Mondeo is the new trapezoid grille – it’s mightily impressive and gives the car a real premium presence. The silhouette is beautifully sleek, while new tail lights at the rear finish things off nicely. The silver roof rails add to the trendy lifestyle image. Inside, the interior of the new Mondeo has gone upmarket with a new centre console design and a visible improvement in the quality of the materials used. It’s usurped by arch rival, the Volkswagen Passat, in terms of quality and aesthetics; still it’s very comfortable behind the wheel and everything is at hand. A new Sync 2 infotainment system ramps things up a notch for the Mondeo, as does the digital element to the instrument dials, and other great tech on board my Titanium trimmed car, like a lane departure warning system and traffic sign recognition. The Mondeo estate is very spacious inside and rear seat passengers can really stretch their legs out. There is more rear headroom in the estate compared to the hatchback. But this is an estate car so it’s all about the boot space. The boot is actually slightly larger in the hatchback at 541 litres vs 500 litres in the estate. But the boot in the estate has a much more practical shape, with great width and depth, which makes it a winner if you have a lot of stuff to carry around regularly. The estate version trumps the hatchback in terms of capacity when you let the rear seats down – 1605 litres vs 1437 litres in the hatchback. Did you think an estate car would be dull and boring to drive? Well the Mondeo estate will banish any of those thoughts as soon as you slip behind the wheel. Despite my test car weighing just over a tonne and a half, it feels agile and light on its feet (or should that be wheels?). It’s not a labour to drive it – it’s actually quite a thrill. The Mondeo grips the road so well and there is no real wallow of its body weight in the corners. My only niggle, and it’s a small one, was that I became aware that the steering was a tad light at speed, I would like a bit more heft to it to enhance that connected to the road feel. It’s poised and controlled on the motorway, a country road or in town – I think you can throw anything at the Mondeo and it won’t let you down. The sound insulation has also been improved, which does a good job of isolating you from road, wind and engine noise. There are three engine choices for the new Mondeo – a 1.6 litre diesel with 113 bhp, a 1.5 litre EcoBoost petrol with 158 bhp, and a 2.0 litre diesel with 148 bhp. There’s an option of an automatic gearbox with the 2.0 litre diesel and that’s the car I was driving. 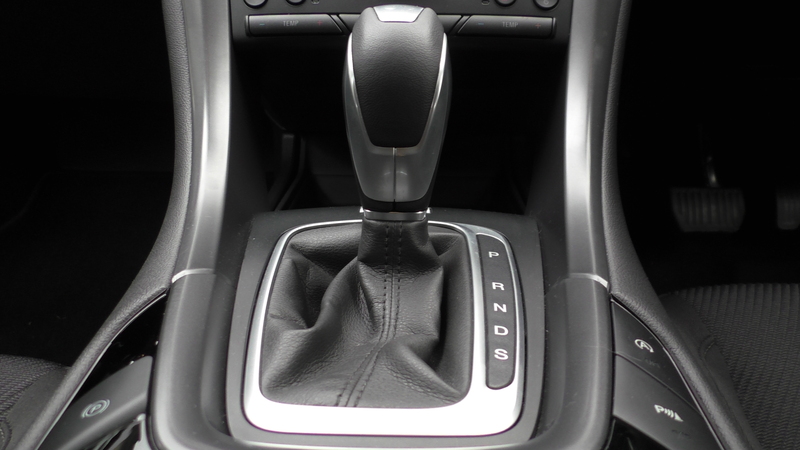 Ford’s Powershift automatic transmission is a dual clutch system, so essentially there are two clutches: one looks after even gears, and the other looks after the odd gears. This makes the gear changes that bit quicker and smoother. With the automatic gearbox, the 2.0 litre diesel will sprint to 100kmh in 10 seconds. It’s a powerful engine, well up for the job, and refined too; there’s a bit of diesel gurgle when you put your foot down hard on the accelerator, but it’s not unpleasant. An automatic gearbox is handy but bear in mind that it’s more expensive to buy than the manual version, and the CO2 emissions and mpg are impacted. The 2.0 litre diesel in the Mondeo with the automatic transmission costs €270 to tax and returns up to 59mpg, while the same engine with a manual gearbox will cost €200 to tax per year and return up to 63mpg. There are three trim levels for the Mondeo on the Irish market – Style, Zetec and Titanium. Zetec and Titanium have most of the goodies with alloy wheels, fog lamps, dual zone climate control, four electric windows and cruise control. The Titanium model has a little more tech on board, with a digital element to the instrument dials, a lane departure warning system, traffic sign recognition, parking sensors and Sync 2, Ford’s updated infotainment system that comes with an 8” colour touchscreen. My test car had the option added of Ford’s new inflatable rear seatbelts for €200 that inflate in a collision to reduce head, neck and chest injuries in rear seat passengers. The Mondeo has gone upmarket with its clean, simple interior, classy looks and lots of great tech on board. The interior does not have the classy finish of a Passat, but it’s still a step up for the Mondeo and the Sync 2 system is definitely worth speccing to improve the overall interior look and functionality. The Mondeo estate is a great choice if you need a more practical boot than what the hatchback can offer, but still want a really good driver’s car. It’s dynamic and sporty looking too, but that’s not a smokescreen – it’s a genuine fun car to drive with great grip and body control. Despite its size, the Mondeo estate is an easy car to drive and manoeuvre (though parking sensors do help!) and it was this agility that impressed me the most. The automatic transmission made this car a dream drive, with smooth, quick shifts and plenty of poke from the 2.0 litre diesel to pick up speed seamlessly. So to sum up the new Ford Mondeo Wagon Automatic: it’s the automatic for the people!